You go, greenback! 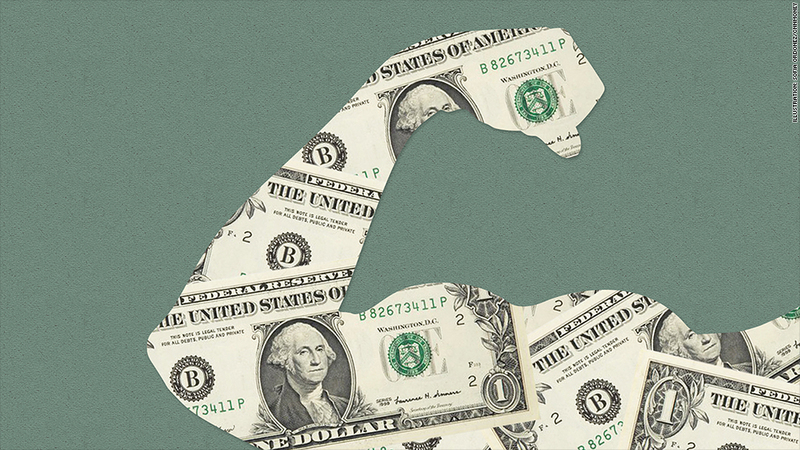 The U.S. dollar is mightier than it has been in more than a year. That may be great news for consumers. But if dead presidents keep gaining strength, that might be bad news for big companies and the stock market. Simply put, a healthy dollar makes it cheaper for U.S. consumers to buy imported goods. It also gives American travelers more bang for their buck when abroad. So if you've been dreaming about a European vacation, now might be an opportune time. The dollar is faring particularly well against the euro. It's gained 5% versus the euro since the start of the year, and it's climbed recently against the Japanese yen and British pound as well. That makes sense when you consider the concerns about deflation in Europe as well as the possibility that more tension between and Ukraine and Russia could dampen growth on the continent. The European Central Bank holds its latest monthly policy meeting on Thursday. ECB president Mario Draghi did hint in a speech last month that Europe may need to launch an asset purchase program similar to the Fed's quantitative easing in order to get the European economy back on track. In fact, the ECB recently hired BlackRock (BLK)to help it put a potential bond buying plan into place. But a spokesperson for the ECB stressed in an email to CNNMoney that no decisions have yet been made about whether the ECB will decide to implement a QE-esque program or when it may start. But Russia fears may have a bigger impact on what happens next for the dollar than what the ECB does. "The dollar's strengthening as of late is more about Russia than Draghi," said Axel Merk, chief investment officer with Merk Investments LLC. "The Ukraine situation is destroying confidence in the European recovery, and more sanctions against Russia will hurt Europe as well." Merk points out that it will be very hard to figure out what Vladimir Putin decides to do next. That uncertainty could lead to even more investors dumping the euro and scooping up the dollar. It's not so much that investors are in love with the dollar. They just hate the euro. "People may be buying the dollar by default. Everyone is piling in on everyone else's trade," Merk said. If that continues, large multinational U.S. firms could be in trouble when they start reporting their third-quarter results in October. Companies such as Coca-Cola (KO), Procter & Gamble (PG), IBM (IBM) and Johnson & Johnson (JNJ) all sell a large chunk of their products and services overseas. Their profits are hurt when they have to translate those foreign sales back into stronger dollars. Ashraf Laidi, chief global strategist with City Index Ltd. in London, said it may not take that much more of a gain in the dollar before multinationals start to feel a pinch. He predicts it could happen if the value of the euro falls below $1.30 and stays there for a while. The euro now trades at about $1.31. "It could happen Thursday depending on what the ECB does," Laidi said. Another problem tied to a stronger dollar? If consumers are lured by bargains on imported goods, that could be an issue for U.S. manufacturers who will have a tougher time competing against international rivals. "It's not an issue yet. But it could be a problem eventually. It's beneficial for the U.S. economy to have more domestic demand," said Kathy Lien, managing director for BK Asset Management. Still, the dollar does seem to be in a sweet spot for the time being. For now, it seems to be benefiting from the same fervor for U.S. assets that investors are showing for American stocks and bonds. Lien said that if there is a good U.S. jobs report on Friday, the dollar could pick up even more steam. So "Buy American" may not just be a patriotic rallying cry. It's also an apt way to describe what investors around the globe are doing.